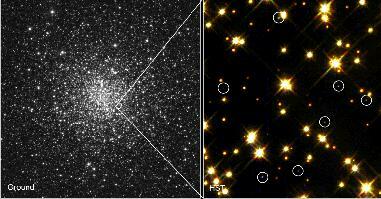 [Left] - A view of globular cluster M4. 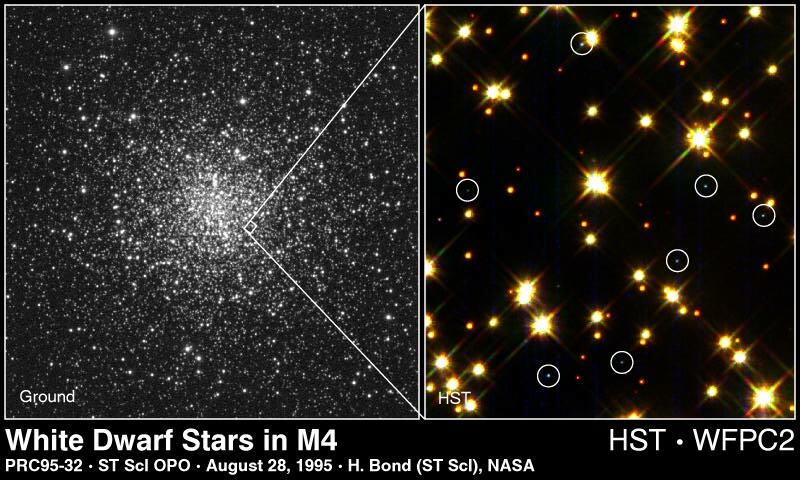 The nearest globular cluster to Earth (7,000 light-years away), and containing more than 100,000 stars, M4 was the target of a Hubble Space Telescope search for white dwarf stars. Ancient red giant stars are predominant in this view from a ground-based telescope. The field is 47 light-years across. The box (right of center) shows the small area that Hubble telescope probed. [Right] - A HST color image of a small portion of the cluster only 0.63 light-years across reveals 8 white dwarf stars (inside blue circles) among the cluster's much brighter population of yellow sun-like stars and cooler red dwarf stars. Hubble reveals a total of 75 white dwarfs in one small area within M4, out of the total of about 40,000 white dwarfs that the cluster is predicted to contain. The Hubble results will allow astronomers to refine theoretical predictions of the rate at which white dwarfs cool -- an important prerequisite for making reliable estimates for the age of the universe and of our Milky Way galaxy, based on white dwarf temperatures. The image was taken with the Wide Field and Planetary Camera 2. Hubble Space Telescope image of stars in globular cluster M4. Marked is a white-dwarf star, which is orbited by the pulsar called PSR B1620-26; this system had been discovered by radio astronomers in 1988. 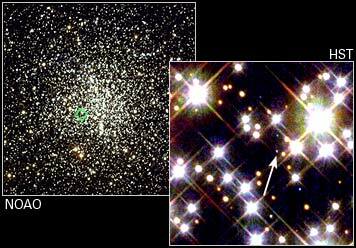 Only the white dwarf is visible in this image. The system has a third companion, the nature of which was subject to a decade-long discussion and research. 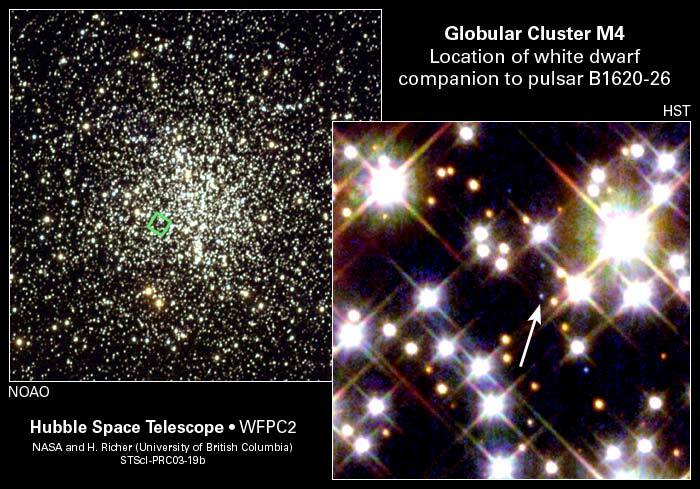 Now, careful Hubble Space Telescope observations of the white dwarf have helped to reveal the nature of this third companion: It has a mass 2.5 times larger than planet Jupiter, and is thus recognized as a planet. Very probably, this planet has formed together with the white dwarf and the other stars of the globular cluster. This is thought to have happened within the first billion years after the universe started to expand, and at the same time when our Milky Way and other galaxies formed. The amount of time is dependent on several cosmological parameters like H0 and the cosmological constant, but is tentatively estimated these times (2003) at about 13 billion years ago, or almost three times the age of our solar system. The existence of this planet points to a presumable abundance of many planets already in early times of the universe. The location of the HST photo (on the right) within M4 is indicated by the green box in the ground-based photo on the left.